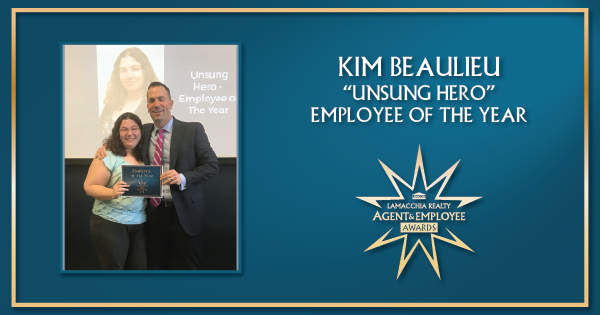 January 10th, 2018 – Lamacchia Realty is proud to announce Kim Beaulieu as the 2017 Employee of the Year. This award is one of the five 2017 Performace Awards announced today by Lamacchia Realty. Kim will jump in wherever needed, from covering other offices to training new staff and agents on systems and procedures. She has an in-depth knowledge of the company and the industry as a whole, is an asset to our team, an excellent resource, and is truly dedicated to her career here at Lamacchia Realty. She sold over 300 homes over 4 years when she was a listing agent for the company before moving to her current administrative role, closer to home out of our Woburn office. To learn more about Kim, click here: Kim Beaulieu.